In Finland, things are simple: you throw your baby in a lake and either they swim, or they sink. Elina has become soft while over here though and wanted to give Venla a gentler introduction to swimming. Our first trip was to Kirkstall Leisure Centre. Here is what I thought of it. 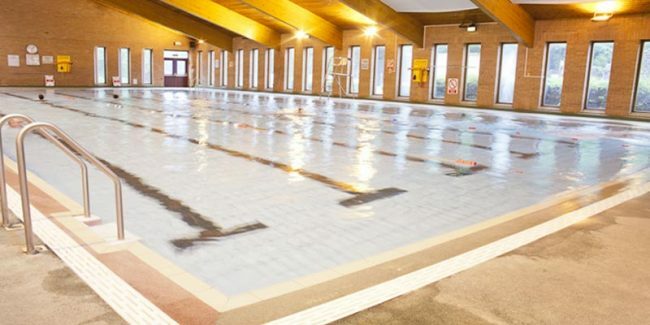 They have a 25-metre pool and learner pool. Unfortunately, when we turned up, the learner pool was closed. We did get a discount because of it, though. The 25-metre pool is almost a learner pool in itself. It starts at 0.8 metres deep and only goes up to 1.6 metres deep, meaning both Elina and I could stand in the so-called deep end. The water was warmer than I expected. We went at 10 am on Sunday morning, and it was quite busy. They had a section of the pool roped off for lane swimming, and it was a generously wide lane, meaning that you could go around without kicking people coming the other way. It did mean you would get stuck behind slower traffic, though. The changing rooms were okay. They were clean, and the showers were a reasonable temperature. No complimentary shower gel, but then I was not expecting any at a public pool. The lack of power sockets was a real problem, though: there was nowhere to plug my hair dryer in. The locker keys were good: a solid rubber strap with a key that folds in. Difficult to operate with one hand, though. This entry was posted on Wednesday, August 2nd, 2017 at 11:00 am and is filed under Reviews. You can follow any responses to this entry through the RSS 2.0 feed. Both comments and pings are currently closed.